That's not particularly helpful, ColdFusion. How about saying what the frickin' error actually was!! However I'm used to this sort of error when something goes wrong with some sort of Java operation. 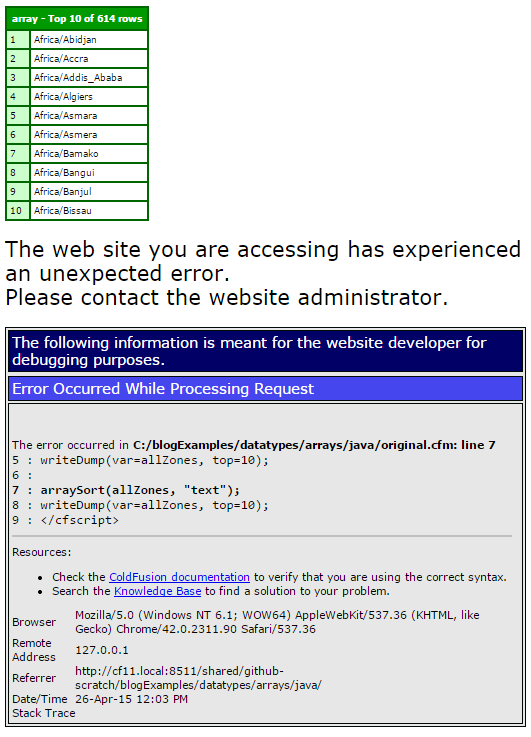 ColdFusion just doesn't report the error back very well. Well... I dunno the minutiae of the detail of the problem, but it's basically that arraySort() is designed to work on a CFML array, and what's coming back from that getAvailableIds() call is a Java array. Those are two different things. And, for one thing, a CFML "array" actually isn't an array in the Java sense of the notion. then split() that string (split() is a java.lang.String method) which returns a Java array of Strings. This is what java.util.TimeZone's getAvailableIds() returns. Use Java to get the name of the class of each "array". Note that the CFML array is a coldfusion.runtime.Array, and the Java array is literally a String array. So not the same type of data at all. 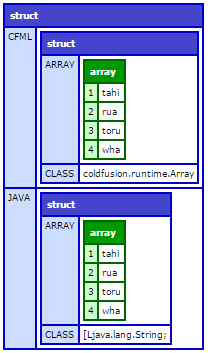 Now if we use ClassViewer to use reflection to look at what methods each type provides for, we see that a coldfusion.runtime.Array has a bunch of arraySort() methods mapping to the CFML arraySort() function, whereas - obviously - normal Java array will not have those methods. So arraySort() doesn't find the method, so it fails. Note that an ArrayList also doesn't have all the same arraySort() methods that a CFML Array has, so I guess ColdFusion is just wise enough to look for a sort() method if the collection passed to arraySort() is an AbstractList (which an ArrayList is). A CFML array is also a subclass of AbstractList. Because the ArrayList does its own sorting, my mate ended up using that method directly, rather than using CFML's arraySort(). Note the result of doing the arraySort() on the Java array: it didn't error, but it also didn't work: the array still has its original order. This isn't so cool. If it didn't work, it should throw an error like ColdFusion does. I'll raise a ticket for that, once I press send on this, so I have a URL to point back to this article to include in the ticket. Here it is: LDEV-320. Righto. On with my Sunday.